Not saying it can't happen to us, but an accidental discharge seems really unlikely. We have this big red handle that we have to pull to activate the system, and I just can't see how we'd ever accidentally pull that handle. The biggest issue for us is remembering to pull the safety pin on the bottle, but I've added that to our checklist now to be sure the system is ready. We've only had one accidental discharge in 5 years, and it was when trying to put the pin back in at the end of the race. Turns out you're not supposed to line up the holes in the handle on the bottle we use. Now we're more careful. Aside from that, I think we've had to send the bottle back for refilling twice in 5 years just due to expiration. 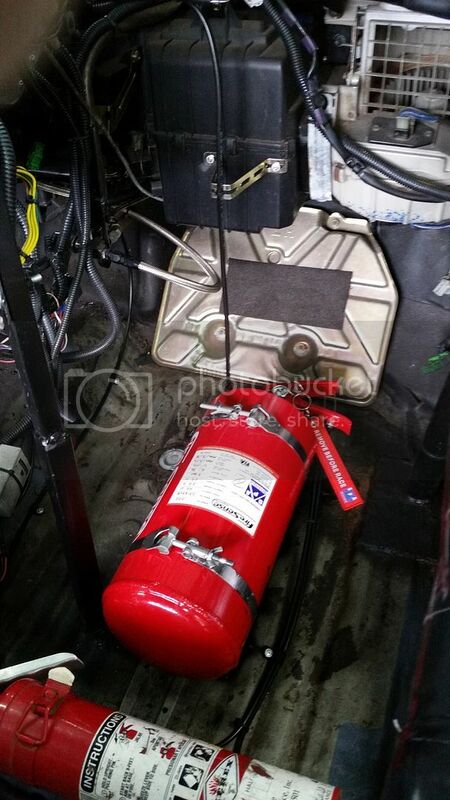 We always kept an extra hand extinguisher and metal bracket on hand in case we lost the system at a race. With the new requirement, we decided to order an extra bottle. It's an added expense, but it's not that big a deal in the long run. Extra bottle expires just like the other one. That means 2x the cost of keeping things up to date, and almost 2x the cost of purchasing the system. That is a big deal to us. Okay, so new question still related: Where do you put the bottle/handle so that an old guy with a fake leg and the other old guys (who only know Lemons racing) helping strap him in don't snag it with a sweatshirt/pocketknife/beltloop/whathaveyou but can still reach/check it during driver changes? I'm looking for pics now that the requirement is clear. I'm not in love with this rule change. I've been using Fire Charger AFF refillable systems in 3 cars. The Lemons Alfa, SCCA and Vintage. We have a firecharger too, since the other series recommended a refillable option. And I figured Lemons wouldn't be slow to adopt AND choose to not align itself with the other series. When entry fees alone are ~$1500 per race, I think an extra $300 up front and an extra $100 every two years is good insurance against mishaps and recoverable fires. Q before you place your bottle and start running lines, measure out all the distance your fluid lines and pull lines need to go. Placing the bottle behind the drivers seat seemed like a good idea at the time, but it limited where I could place the pull handle without ordering a longer cord. I put it there because it seemed like the least likely area for the bottle to get accidentally discharged. I also thought I might put a passenger seat in for on track training purposes, but I doubt that will ever happen. When I redo for a new SFI bottle, I think I will put in the passenger area to shorten all the lines needed to get to the driver and engine compartment. It will also be easier to pull the handle directly on the bottle if the remote pull handle fails. There is not a lot of room in your Porsche, so I think you are limited on options. I don't know what you need to check during driver changes, I just pull the pin on Saturday morning and put it back in on Sunday afternoon. VKZ: Thanks for the pics. Just a point of clarification, for those wanting a spare bottle for at least their team, we are looking at lets call if $400 per car plus extra bottle plus recert of those bottles every two years. So for us that is 3-4 bottle every two years...it does start to add up. I am not specifically complaining as much as making the impact clear. We likely will never run more than two cars at once but unlees we want to swap the system each time from one secondary car to another, we have three systems to buy and the bottle from the third, unused that race system goes to the track as our spare. $1200'ish upfront and $300 every two years. Building a stable of terrible racecars is not for the faint at heart or severely cash strapped. This definately calls, in my mind, for cooperation amongst teams that frequent the same track and know each other well. Agree on system you will all use and have one sucker coordinate the spare bottle for like 15 teams. Each team chucks in a $20 and then it becomes a monetary non-issue. When recert time comes around, a new sucker is elected to keep charge of it and the teams check in a $5'er. Q before you place your bottle and start running lines, measure out all the distance your fluid lines and pull lines need to go. Placing the bottle behind the drivers seat seemed like a good idea at the time, but it limited where I could place the pull handle without ordering a longer cord. I put it there because it seemed like the least likely area for the bottle to get accidentally discharged. I put our bottle in the passenger foot well area for ease of plumbing the lines and the pull handle, but mostly because it's the one spot we don't really use to haul stuff to the track. Since we have an open deck trailer, everything like parts, fluids, tools, etc has to go in the rear seat/hatchback area, and we cram it FULL. I think Eric Rood (or somebody) needs to compile a FAQ for the tech section on the website to answer a lot of questions that are bound to come up with this new rule. According to SPA's MSDS, their AFFF system has ethylene glycol in the mix to prevent freezing. SPA's AFFF agent freeze point is 14 Fahrenheit or -10 Celsius. Better than 32 degrees but not low enough in the Northeast to prevent freezing. I just contacted Stable Energies, and we are shipping our bottle back to them for re-certification. I've read that the SFI and FIA systems both have a 2-year re-cert window, but it's interesting that the new 2019 Lemons rules don't mention that 2-year window. Yes, I know the rules state it's the responsibility of each team to ensure their fire suppression system is within the manufacturers re-cert window, but since when have they left it up to us? I guarantee that if the bottle date isn't checked at tech, we'll be seeing out-of-date bottles pretty soon. Isnt SFI switchiing to an exparation sticker for everything? Like they did with harneses? So can the second pull cable be located inside like the post pic above shows? SPA says locate outside the vehicle. AFAIK, there is no "rule" on where it's to be located, and the 2nd handle isn't even required. I placed it there as it can be easily accessed from outside the car, yet not susceptible to getting damaged. Any other pull is for someone outside trying to get the driver out, so think about where best to put that that will also be protected from the elements and inadvertent whoopsies. I would say think about it being on the drivers side of the car unless your driver pull is on the outboard side already. Because it HELPS buy time in a fire. It's not necessarily meant to fully extinguish a fire. You could pull it on the Passenger side, and by the time you run around to the drivers side to help them out the fire could relight. Although really, don't use your kill switch any more than absolutely necessary because it's not meant to be an on-off switch, it's a KILL switch. The Kill Switch has a life span, and the more times you use it, the closer it is to death. Ours gets used when it's checked at tech, and that's about it. We have a toggle for ignition, and a push button for start. 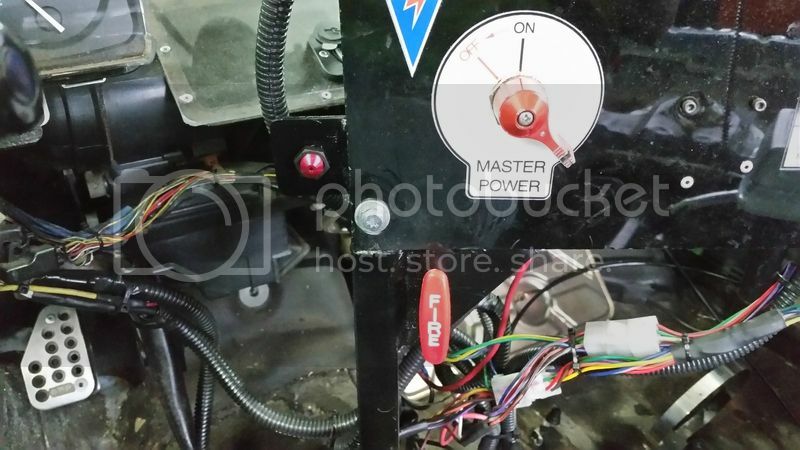 We use the ignition (toggle) switch to stop the engine, just like you would in a street car. 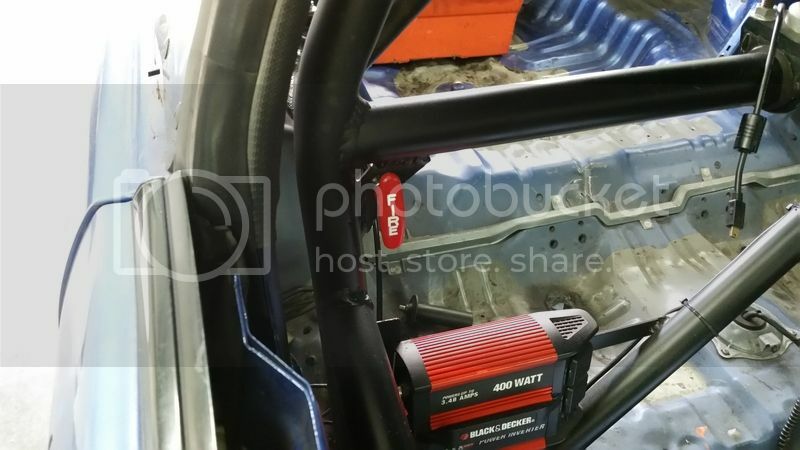 Also worthy of note, some cars have ECU's that will go into "re-learn mode" each time the battery is disconnected via the kill switch, and you may not have full performance for a few laps. Assuming you care about that sort of thing. Just got mine from the Lemon store link very nice system just a heads up they where back ordered . Although you probably won't get caught, this is technically against the rules. You are supposed to have the kill switch off during refueling. 3.C.1 Fueling. All fueling must be done from handheld DOT-, SCCA-, or FIA-approved 5-gallon or smaller jugs or from the track’s permanent pumps. During fueling, the kill switch must be off; no one can be in the car; and NO other work may be done (no fluid or tire checks, no screwing with the camera, etc.) except adding ice to a driver-cooling system after fueling is fully completed. At least two crew members must participate in fueling, all wearing the same safety gear as a driver. Visors must be down. At least one team member must have a fire extinguisher in hand, ready to shoot, aimed at the fueler or fuelers. Fueling locations vary by track and are covered at the Drivers Meetings. Participants are responsible for knowing all fueling rules and accepted locations. Out of the things we all do that is unsafe in this series, not using the kill switch (designed for emergencies) during a pit stop is not even in the top 50. Killing the battery for fueling after the car is shut down is nowhere near as rough on the switch as using it to shut off a fully running car. If you designed your electrical system well you should be switching off less than 1/2 amp of Battery Hot Bus which the switch shouldn’t even notice. Switching high amps is what makes life hard on a kill switch. But still, unless you habitualy pin the system before fueling, keep the fire handle separate from the kill. You will grab the wrong red handle eventually.